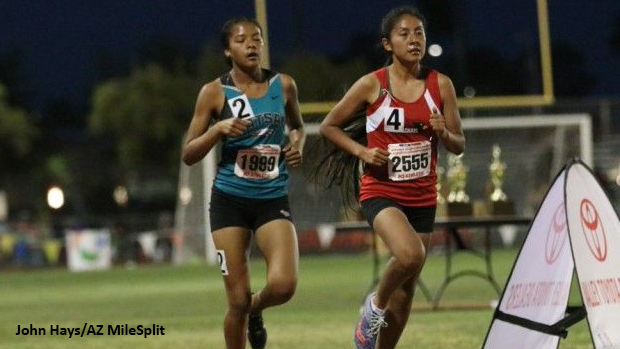 We continue to release our preview lists of the upcoming outdoor track and field season and today we're talking about the top returning distance runners among Division 4 girls. In addition to being the returning D4 Girls State Champ for 400m, McKenna Lane (Scottsdale Prep Academy, Jr.) is the returning D4 Girls State Champ for 800m as well. Last year, she ran a personal best of 2:18.54 at the Fountain Hills Friday Night Fever and was the only girl from Division 4 to dip below the 2:20 mark. In 2018, Ali Upshaw (St. Michael, Jr.) racked up two State Titles in Track (D4 Girls 3200m) and Cross-Country (D4 Girls race), and finished runner-up in the D4 Girls 1600m at State. This year, she's ranked the top returner among D4 Girls for both the 1600m and 3200m. Precious Robinson (Pinon, Sr.) finished runner-up in the D4 Girls 3200m at last year's AIA State Meet. This past fall, she finished runner-up in the D4 Girls race at the AIA Cross Country State Champs, and we can for sure bet that she'll give throw everything she's got at Upshaw in the D4 Girls 3200m this May. Olivia Mountain (Chandler Preparatory Academy, Sr.) will also be a likely contender in the middle-distance races, after finishing 3rd in Girls 800m last year and running a 5:15 PR for 1600m from the AZ Meet of Champions. Check out our full lists of the Top Returning D4 Girl Distance Runners in each event.